KE00008 is a solid phase sandwich Enzyme Linked-Immuno-Sorbent Assay (Sandwich ELISA). 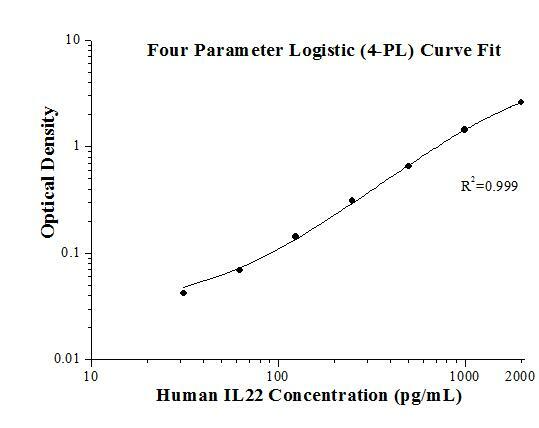 The IL22 ELISA kit is to be used to detect and quantify protein levels of endogenous IL22. The assay recognizes human IL22. A monoclonal antibody specific for IL22 has been pre-coated onto the microwells. The IL22 protein in samples is captured by the coated antibody after incubation. Following extensive washing, a monoclonal antibody of biotinylated specific for IL22 is added to detect the captured IL22 protein. For signal development, Sterptravidin-HRP is added, followed by Tetramethyl-benzidine (TMB) reagent. Solution containing sulfuric acid is used to stop color development and the color intensity which is proportional to the quantity of bound protein is measurable at 450nm. Interleukin 22 (IL22) is a member of the human type I interferon family, which includes IL10. IL22 has the potential to interact with IL10 because it binds to the IL-10R2c chain with IL22R1 in its receptor complex. Binding can be blocked by the soluble receptor, IL22 binding protein (IL22BP). Although known as a Th17 cytokine, IL22 is also expressed by a wide range of immune cells, including NK T, γδ T, and NK cells. IL22 can contribute to immune disease through the stimulation of inflammatory responses, S100s and defensins. IL22 also promotes hepatocyte survival in the liver and epithelial cells in the lung and gut similar to IL10.